Today, most IoT devices talk directly with the cloud over Wi-Fi or cellular. Our newest hardware development kits are different. 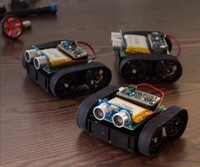 Meet the Argon, the Boron, and the Xenon, our third generation hardware development kits, powered by Particle Mesh. 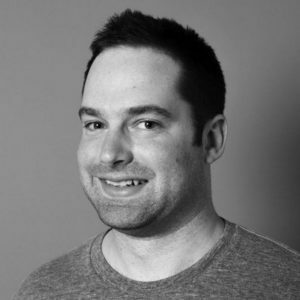 Particle Mesh is a mesh networking technology built on Thread, and designed to connect the spaces in between existing Wi-Fi and cellular deployments with local networks that are low-cost, secure, and ultra-reliable. Our new dev kits aren’t just connected to the Internet—they’re gateways to the Internet. 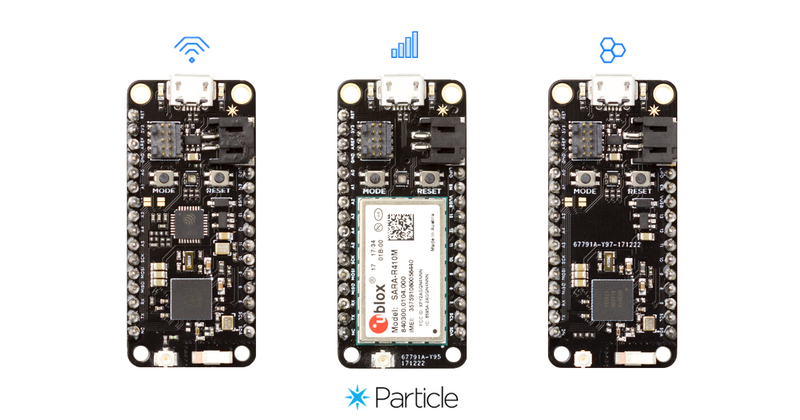 With Particle Mesh, each dev kit creates local wireless networks that other devices join to help collect sensor data, exchange messages, and share their connection to the cloud. To celebrate the launch, we’ve slashed the normal price for all our new Particle Mesh hardware during preorder. We want you building bigger mesh networks and doing it for less. Our mesh-ready hardware starts at just $9 and ships in October 2018. But there’s even more news to share—we bumped up the bandwidth limits for all cellular data plans. Yes! You read that right! (See below for specifics.) We’re excited to see what problems you solve with even more cellular data at your disposal. 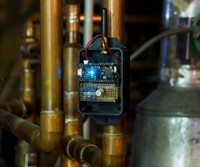 Traditional IoT devices that use Wi-Fi and cellular connectivity depend on the cloud to relay messages between devices. This works great when you’re making a standalone product – but many IoT solutions require something more. Particle Mesh devices create local wireless mesh networks that other devices can join. 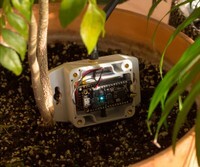 They help collect sensor data, exchange local messages, and share their connection to the cloud. Devices work together to ensure that messages get where they’re going, and enable new solutions that weren’t possible or economically feasible with Wi-Fi or cellular alone. 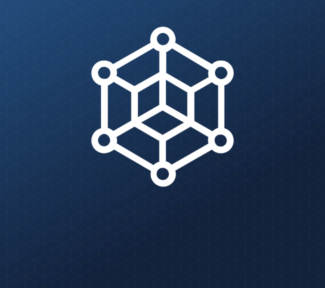 Particle Mesh is designed specifically for IoT applications and built to solve some of the most common problems that affect connected solutions at scale. With more devices, more sensor data, and better connectivity, smart devices become even smarter. That’s why we’re so excited about Particle Mesh and the new family of IoT hardware. To get all the awesome benefits of Particle Mesh, you’ll need new hardware with mesh radios. Not to worry, we’ve built three: the Argon, Boron, and Xenon. 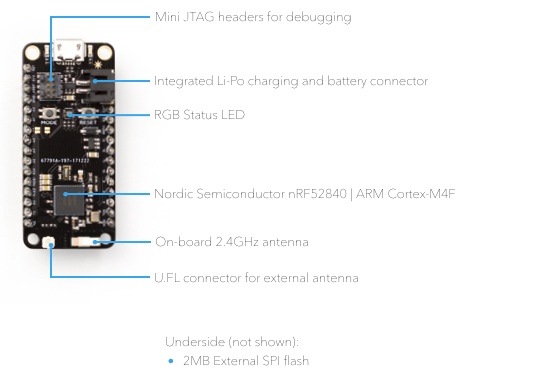 All three devices are built around the Nordic nRF52840 MCU + BLE + mesh radio and follow the Adafruit Feather specification. The Argon is a Wi-Fi plus mesh device that can act as a standalone Wi-Fi endpoint or Wi-Fi gateway for a Particle Mesh network. It’s great for building your local network and sharing its connection to the cloud over Wi-Fi. It’s packed with a bunch of other great features, like Bluetooth 5 and NFC. 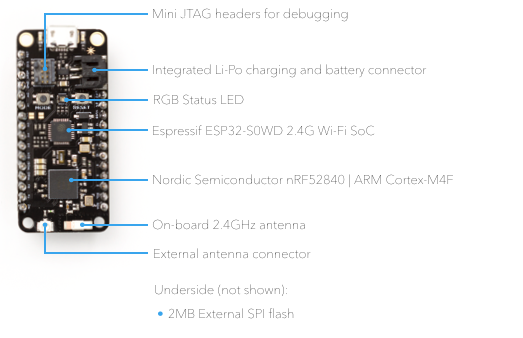 Plus, the Argon uses the extremely popular ESP32 from Espressif. Learn more about all of the specs on our Argon preorder page. The Boron brings the LTE and can act as a standalone LTE endpoint or LTE gateway for a Particle Mesh network. Using industry trusted u-blox cellular modem, the Boron is ideal for those remote locations where Wi-Fi isn’t to be found or can’t be trusted. 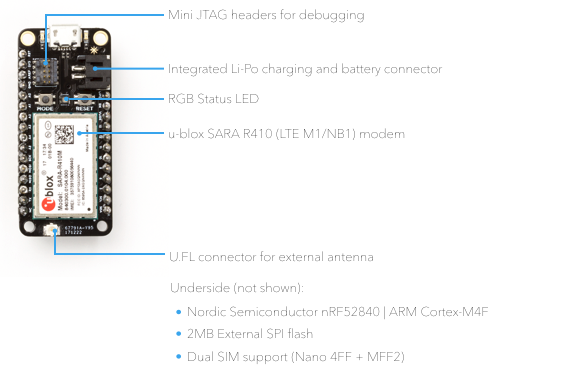 The Boron is compatible with LTE CAT-M1/NB1, the very latest cellular technologies for IoT devices, and is launching with support in the US and Mexico via the Particle MVNO. For developers still waiting for LTE M1/NB1 to be deployed by their local carrier, the Boron also comes in a global 2G/3G version. Learn more about both options and see which version of the Boron is right for you and your network. Xenon is all mesh all the time and can act as an endpoint or repeater in a Particle Mesh network. 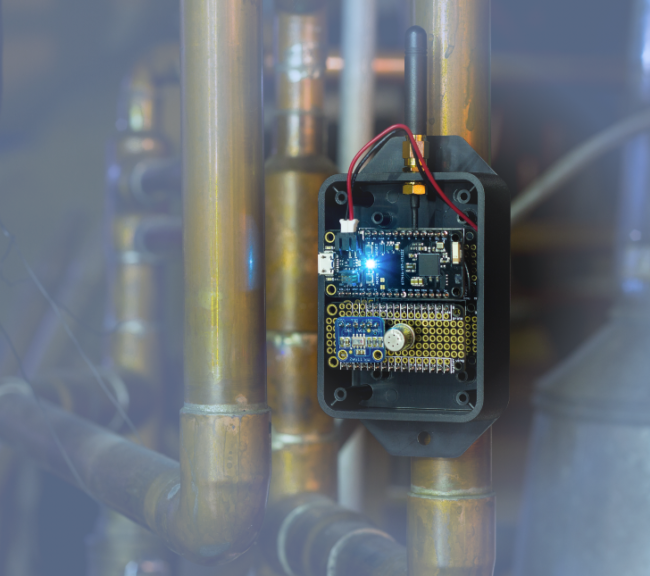 This makes the Xenon the perfect low-cost solution for connecting sensors, actuators, and other endpoints to your local mesh network. Add more Xenons to your network to extend its range and connect all the spaces where Wi-Fi and cellular can’t quite reach. 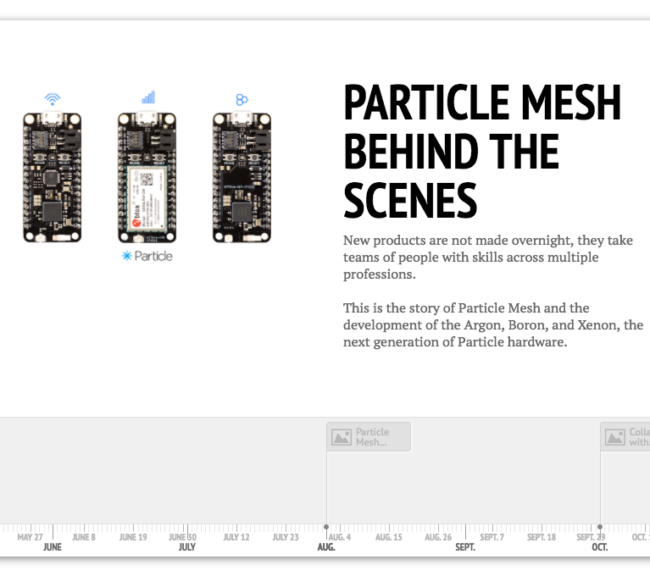 For more about each product and about Particle Mesh, browse on over to the preorder site. And don’t delay, during the preorder, we’re discounting our Particle Mesh-Ready development kits. These deals won’t last. Particle Mesh is built on OpenThread and in alliance with the Thread Group. We’re using open standards and specifications because there’s no reason to design a good thing twice. All our new next generation hardware uses Adafruit’s Feather form factor, providing pin-to-pin compatibility with 50+ FeatherWing hardware accessories. Starting today, our $2.99 cellular Device Cloud plan includes 3MB of data per month. Up from 1MB per month, that’s three times the data and all for the same price. Cellular data overage cost less too—down from $0.99 to $0.40 per MB. For our existing Electron owners, you’ll receive the benefits of the new pricing automatically. And as always, for new cellular devices, your first three months of data are on us. For professional IoT product creators, new Device Cloud pricing is improved to help you scale towards production and beyond. We listened to your feedback and designed our pricing to be more transparent, flexible, and better align with how Particle creates value for your business. With less metering and more features, it’s a win for everyone. Learn more about all the changes to Device Cloud pricing here. What problem will you solve first? Our third generation of hardware is more than just access to mesh networking for your connected devices; it’s an end-to-end developer solution to build smarter products capturing better data, all at a much lower cost. From the Photon to the Electron and now to the entire Particle Mesh family—the Argon, Boron, and Xenon—the power of real IoT is in your hands. Don’t forget, the preorder is live now with awesome early bird pricing. 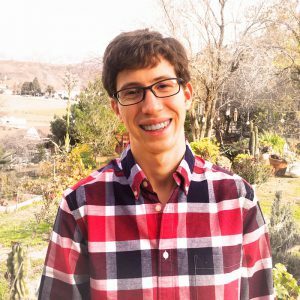 Go grab your developer kit right now!